The £90m (135m euro) satellite was riding atop a Rockot launch vehicle, a former military rocket modified by the addition of a newly manufactured third stage. 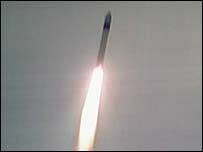 3 - 1508: Second stage separation due - but scientists believe that a software error meant this did not happen. The rocket plunged back to Earth when its fuel ran out.